Significant work continues in local steams and creeks to prepare for the spring snowpack melt. Freshet is the snow melt that typically occurs from April to July, in British Columbia. Freshet can become a problem when winter snow packs melt rapidly, overwhelming stream channels and creating floods. As spring freshet approaches we closely monitor all flooding factors in consultation with provincial departments; including snow pack levels, temperatures and precipitation forecasts. Freshet flows depend on these factors and dictates the timing of peak flows. Preventative measures, such as sandbags or bladder dams, may be proactively placed along strategic locations throughout the city to protect critical infrastructure. The potential for flooding exists every year, and property owners living near creeks, streams, low-lying areas and lakefront are responsible for having a plan and protecting their properties. Subscribe to receive email updates or learn more about local, provincial and federal preparedness resources at www.cordemergency.ca. In 2017 and 2018, record setting rainfall in 2017 combined with snow melt, saturated ground, and high groundwater levels resulted in major flooding in Mill Creek with considerable damage to Bellevue Creek and the Okanagan Lake foreshore. City staff and contractors are working through a list of 52 locations in Kelowna that require repairs after last spring’s snowpack melt and ensuing flood, at a cost of approximately $10.7 million. About $3 million in works completed or underway so far include the repairs to Upper Vernon Creek and Bellevue Creek dredging. 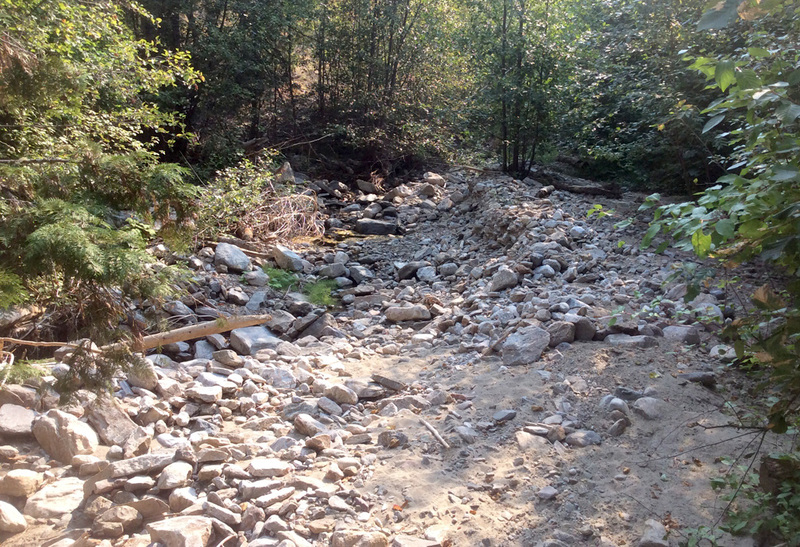 Creek channel capacity restoration projects continue to be our priority right now, with crews doing erosion remediation and more gravel removal from Bellevue Creek and Mill Creek. 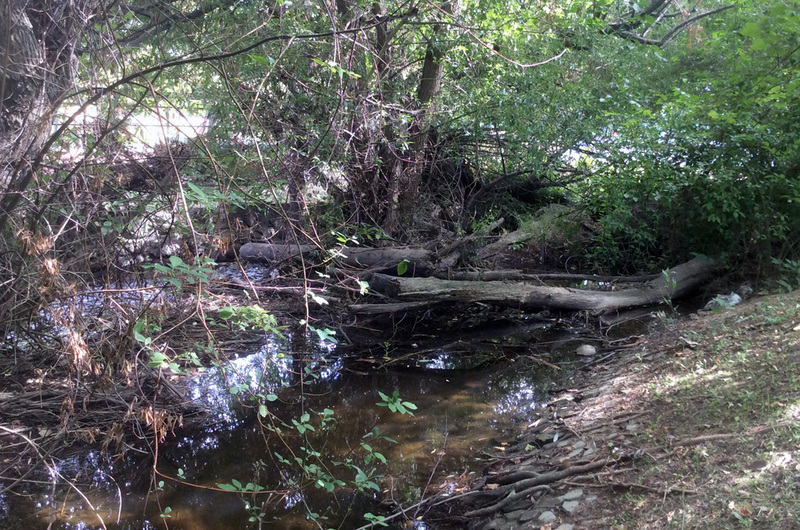 Contractors are also removing vegetation in and around Mill Creek, along with dredging to increase the creek’s ability to handle higher water flows that occur during spring runoff. Bellevue Creek originates near Little White Mountain and runs northwest through Okanagan Park, Crawford Falls and Canyon Falls before it reaches Woodhaven Regional Park and flows into Okanagan Lake near Fuller Road. The lower part of the creek is considered by the province to be Rainbow Trout and Kokanee fish habitat (although not used extensively at this time) and features old berms from historical channel clearing and some retaining walls built to contain high flows on private property . The 2017 and 2018 freshet caused significant channel bank erosion and movement of sediment and resulted in large volume of gravel deposited in the creek bed. If left in place, future high water events may cause further erosion and movement and damage nearby property and infrastructure. Restoration of the creek capacity after the 2017 freshet was completed in the spring of 2018. The Province approved additional work a second time after the 2018 freshet. This work was undertaken in February and March 2019. Retoration work takes place in multiple locations and involves the use of heavy equipment for removal of the accumulated gravel and trucks to haul the gravel away. Fallen trees and debris that may block or redirect flow will also be removed. As possible, creek flows will be diverted around the work area during construction to minimize environmental impacts. With the exception of access points, equipment will work within the creek channel below the natural boundary. This work is critical to ensuring the stream channel has the capacity to safely hold future freshet flows. Futher restoration work will take place in the spring and fall of 2019 to restore disturbed areas with riparian vegetation and replace trees. Mill Creek originates in the hills northeast of the city and flows southwest through the city entering Okanagan Lake near the W.R. Bennett Bridge. After the creek crosses under Harvey Avenue near Burtch Road, it is constricted by urban development all the way to Okanagan Lake. These restrictions to the creek channel are an ongoing concern to the City and the Province since there is limited capacity to safely pass high flows during flood events. In response to these concerns, the City and the Province constructed the Mill Creek diversion structure in the 1980s that can divert high flows for lower Mill Creek. Since the diversion works were completed in the 1980s the channel downstream of the diversion has become progressively obstructed by vegetation. Some is brush that has grown into the channel, and some is large deciduous trees (e.g., willows, Siberian elm) that have also grown in the channel or across the channel. All this overgrown vegetation has progressively restricted the flow such that in 2017 the channel was not capable of diverting the flow levels it was designed for and certainly cannot pass the bankfull flow recommended in the Ministry of Environment report. As a result of the obstructed flows, there was severe and costly flooding within the city during the 2017 high flows. The City's assessment also determined that the creek channel from Okanagan Lake upstream to Ethel Street has diminished capacity due to sedimentation. It is likely that this sedimentation is related to the flood event in May 2017. Vegetation, trees, and brush have encroached into the channel reducing the flow capacity to near zero in some locations. In addition, there are constructed obstructions (e.g., private fences) that collect debris and reduce flow capacity which contributes to the potential for flooding. Damage to city infrastructure due to the 2017 flood was identified at Spencer Road, where it crosses Mill Creek. The flood damaged the three corrugated metal culverts and caused aggradation within the channel upstream of the crossing and resulted in overbank flows which caused extensive residential flooding. With Ministry Approval, the City repaired the damaged culverts in 2018 and will remove accumulated gravels prior to the 2019 freshet. A longer range plan to replace the existing culverts with a larger open bottom arch culvert (or equivalent) is underway. This project is now in the construction phase and is anticipated to be completed prior to the 2019 freshet. In the spring of 2018 and with Ministry approval, the City began removing the accumulated sediment in the channel to help restore channel bankfull design capacity. Due to the restricted access and complexity of the work involved, the City was unable to remove accumulated sediment between Abbott and Ethel Streets, except at road crossings. At that same time, the City began removing the obstructing trees and vegetation from below the natural boundary of the stream. Due to the short period between receiving Ministry Approval and the rising waters in the channel, and despite having six or more crews working long hours, the City was not able to complete all the necessary work. Phase 2 of this effort will resume in the spring of 2019 with the intention of removing the remaining high hazard trees within the channel. In addition to the Phase 2 efforts, the City will begin restoring the disturbed riparian vegetation and replacing trees removed from the channel. The replacement trees will be placed well above the natural boundary. Restoration of the riparian values along the channel is essential in preserving stream health, fisheries values, and water quality. In anticipation of a repeat to the 2017 flooding, the City deployed several kilometers of Tiger Dams and sand bag walls along the Mill Creek channel prior to the 2018 freshet. In several locations, berms were constructed to provide additional flood barrier. Due to the City’s efforts to remove sediment and obstructions to flow from within the channel the 2018 freshet, which generated the same flow volumes that were observed in 2017, did not result in any significant flood damage to infrastructure or private properties in the City. The 2017 and 2018 freshet flows have driven home the need for ongoing and regular channel maintenance of our urban streams. Priest Creek Linear Park consists of a walking path and three wooden bridges to allow for pedestrians, cyclists, and equestrians access into the Myra Bellevue Provincial Park. This park provides a unique riparian experience as the walking path meandered alongside and over the creek. At the south end of the park, Priest Creek is confined by a steep valley that was burned during the 2003 Okanagan Mountain Park fire. The northern portion of the park is undisturbed natural forest and the valley floor expands onto a fan; historic channels are evident. The walking path was surfaced with crushed gravel on the fan and left as a natural dirt path at the south end of the park where the path climbs away from the creek on the east side of the channel. Currently the park remains closed as it is not safe for public use. The 2017 flood caused significant channel erosion and scour as well as several channel avulsions within the park that isolated two walking bridges and damaging the walking path in several locations. Due to an upstream channel avulsion, the creek formed a new channel west of the original channel which was diverted by a deflection berm back into the main stem near the north end of the park. The walking path crosses the new channel after passing over the deflection berm. At two of the bridges, bed material filled in the original channel causing channel avulsions. The new channel has scoured to a greater depth than the original channel making it both difficult and expensive to try to restore the flow to the original channel. Since this is a small natural park area, it is recommended that the flow be maintained in the new channel and the path be extended to cross the new channel using fords rather than bridges. As a result of the extent of disturbance in the channel through the park it is expected that the flows will remain high in the future during spring freshets. For this reason, ford crossings are recommended rather than installing new bridges since a ford can be easily restored after a spring freshet if necessary. If fords are used it may be necessary to close the park during the spring freshet when it would be unsafe to cross the flowing stream. This approach is commonly used elsewhere where walking paths may be flooded during high flows. Pending Ministry approval, the City plans to restore sections of the walking path by removing gravel and debris from the path, constructing stream ford crossings, and repairing one bridge.